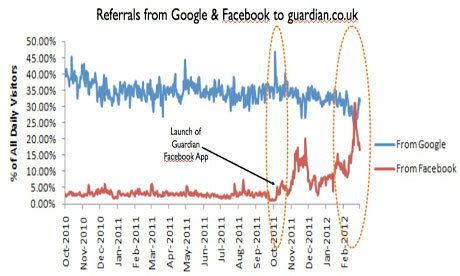 She also showed this graph, which illustrates that last month “for the first time in our history, Facebook drove more traffic to guardian.co.uk than Google for a number of days, accounting for more than 30% of our referrer traffic.” Social traffic has dipped back below search, but Tanya described it as “a seismic shift”. You can read the full text of her talk online, and also the text of a talk I gave about the app at news:rewired in February. In February 2004, whilst at Harvard, Mark Zuckerberg and friends created “The Facebook”. What started as just a website for one university has become one of the dominant forces on the internet in the early 21st century. The simple idea of connecting people together into networks of friends sharing their personal details has made Mark Zuckerberg, on paper at least, one of the wealthiest men on the planet. This is the story of the rise and rise of Facebook, as told in six years of original journalism, writing and comment in the pages of the Guardian and the Observer. “Facebook: The rise and rise of a social media giant” - £2.56 for Kindle & £2.99 for iBooks. By Martin Belam on 22 March 2012.